Deoxys vs. Rayquaza! Who will win in this high-powered Pokemon showdown? Our seventh stop on the journey through all of the Pokemon films is Destiny Deoxys, known in Japan as 「裂空の訪問者 デオキシス」(lit. “Sky-Splitting Vistory: Deoxys”, officially “Deoxys the Visitor”). The film first screened in Japanese theaters on July 17, 2004 and came direct to American television courtesy of Kids’ WB! on January 22, 2005. Our previous film, Jirachi: Wishing Star of the Seven Nights, proved to be a rather disappointing start to the new Advanced Generation series of films. Will Deoxys the Visitor (hereby Deoxys) continue down the same path of mediocrity or will it veer off towards the road of success? In the North Pole, a certain Dr. Rondo (Professor Lund in the English dub) and his research team are studying the local Pokemon. Nearby, Dr. Rondo’s son, Tooi Rondo (Tory Lund in the English dub), is playing with the local Pokemon and is having a blast. That is, until a meteorite hurtles through the sky and lands nearby, frightening the Pokemon and causing a stampede. Tooi is caught in the middle of the stampede, but finds refuge next to a nearby boulder, stuck there watching the Pokemon flee from the impact zone and cause a ruckus around him. In his fright, Tooi loses consciousness. From the impact zone, the Pokemon Deoxys appears. Though there are initially two of them, one of them is heavily injured from the landing and turns into a crystallized rock to protect itself. The other Deoxys (hereby Deoxys 1) is about to flee with the dormant Deoxys (hereby Deoxys 2), but a Rayquaza descends from the stratosphere and begins to attack Deoxys 1, causing it to drop the rock containing Deoxys 2. Because the pair of Deoxys descended through the upper atmosphere, Rayquaza feels that its territory is invaded, hence the attack on Deoxys 1. Thanks to its regenerating body and psychic powers, Deoxys 1 conquers Rayquaza, but sustains a critical wound from a Hyper Beam attack. Deoxys 1, drained of its energy, turns to stone and falls down in the arctic ocean, both Deoxys now dormant. Dr. Rondo, after bringing his son back to safety, decides to have his research team take the stone containing Deoxys 2 back to his lab for study. Fast forward four years to the present day, and Dr. Rondo and his assistants are attempting to revive Deoxys 2, but lack the necessary energy to power their machines. In the meantime, our heroes, Satoshi (Ash Ketchum) and his friends Takeshi (Brock), Haruka (May), and Masato (Max) are riding a train into a certain LaRousse City, a city that prides itself on its incredible scientific accomplishments and its main attraction, the Battle Tower. Here, Satoshi hopes to challenge strong trainers to battle to help him grow stronger. While rushing to sign up for the Battle Tower battle circuit, Satoshi meets Tooi, who gets dragged into a tag team Pokemon battle as Satoshi’s partner. Tooi has no Pokemon, and thus Satoshi, unable to fight two skilled trainers by himself, is eliminated from the Battle Tower circuit. When both are released back to the main lobby, Tooi runs off leaving Satoshi behind. One of Dr. Rondo’s assistants, Yuko, manages to catch up to Satoshi and explains to him Tooi’s history. Ever since he was caught in the middle of a Pokemon stampede, Tooi has been afraid of Pokemon and has never been able to bond with them due to his fear. Satoshi happens to catch sight of Tooi help a Minun who was caught inside of a trash can. Seeing that Tooi cares for the wellbeing of Pokemon despite his fear, Satoshi and his friends decide to try and help Tooi overcome his phobia. Back at the North Pole, Deoxys 1, defeated four years prior by Rayquaza, has finally recovered enough energy to revive itself. With its companion, Deoxys 2, nowhere to be found, Deoxys 1 flies off in search of Deoxys 2. Eventually, this takes Deoxys 1 to LaRousse City where Dr. Rondo’s lab is. During Deoxys 1’s flight, Rayquaza spots Deoxys 1 making its way towards the city. Still enraged, Rayquaza follows Deoxys 1 towards LaRousse city. When Deoxys 1 arrives in LaRousse City, it has a difficult time seeing anything. It turns out that Deoxys sees certain kinds of electromagnetic radiation and, due to the interference caused by the living organisms and active technology in LaRousse City, it cannot locate the specific EM signal that Deoxys 2 is giving off. In order to make its vision clearer, Deoxys 1 puts a barrier around the entirety of LaRousse City, blocking the wind that powers the turbines from blowing. This shuts down most of the city’s main functions. Rayquaza, when it arrives, also finds that it cannot break through Deoxys 1’s barrier which buys Deoxys 1 time to search for Deoxys 2. After the power dies out, Satoshi and the rest of the crew find that they have to escape the city post-haste. As they travel the streets, they note that Deoxys 1 has created clones of itself and those clones are abducting people and Pokemon. To escape them, the group hide underground as they formulate a plan to escape. During this time, they discover that the people and Pokemon that are being abducted are merely being brought to a central location unharmed since they interfere with Deoxys’ vision. After putting two and two together, Yuko realizes that Deoxys 1 is searching for its companion and the group comes up with a plan to revive Deoxys 2 from its crystallized state. The group sets off and sneaks through the city to free the abducted people and Pokemon, and set to work rerouting the emergency power to Dr. Rondo’s lab. 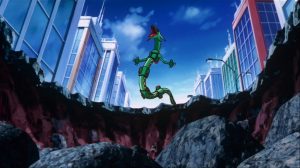 During this time, Rayquaza finally manages to break through Deoxys 1’s barrier and begins to wreck havoc on the city. While Deoxys 1 and Rayquaza fight, the crew manages to revive Deoxys 2, who immediately flies off to reunite with Deoxys 1. Though the two have reunited at last, Rayquaza still attacks. Since the barrier was removed, the wind currents are once again free to blow the turbines bringing the city back online. The city’s defense robots catch site of Rayquaza destroying the city and activate to stop it. However, the master defense robot gets hit by an electromagnetic pulse from the Deoxys and goes on the fritz. It then calls upon all the other security units to subjugate and stop Rayquaza, leading the security bots to overrun the city. Rayquaza puts up a fight, but is unable to stop the countless number of bots. Just as Rayquaza is about to be crushed underneath, the two Deoxys enter and use a barrier to protect Rayquaza. Since Satoshi and Tooi are close to the scene, they are given instructions by Dr. Rondo on how to stop the rampaging security bot. 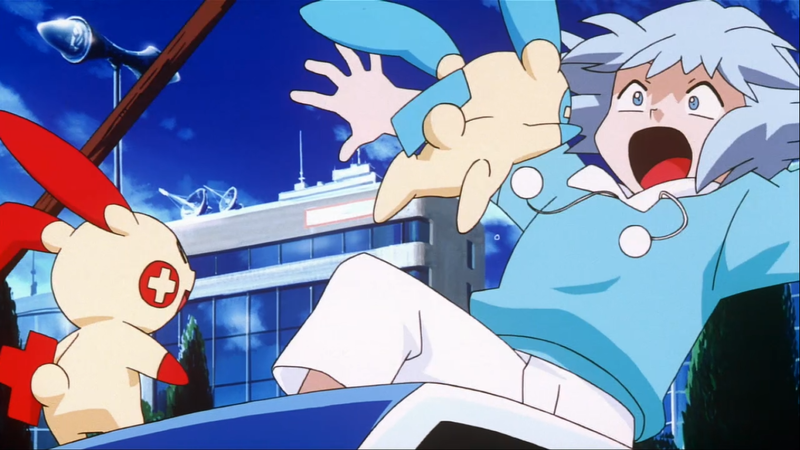 The two manage to successfully stop the security bots, but Tooi sees the Plusle and Minun from earlier get knocked off of the building thanks to a stack of robots they were standing on collapsing. Without thinking, Tooi jumps from the building to save the two Pokemon. As they fall, Deoxys 2 saves them from their fall using its psychic abilities and brings them to safety. Rayquaza, realizing that the Deoxys are friendly and meant him no harm, returns back to the stratosphere. At the end of the movie, Satoshi, Tooi, and the rest of the gang see off the two Deoxys as they prepare to resume their journey through space. At the beginning of the movie, Tooi saves a Minun who gets caught inside of a trash can. Minun tries to give Tooi a hug, but Tooi flinches away. I said in the previous review for Jirachi that the rest of the Advanced Generation films would be focusing on the bonds between humans and Pokemon. 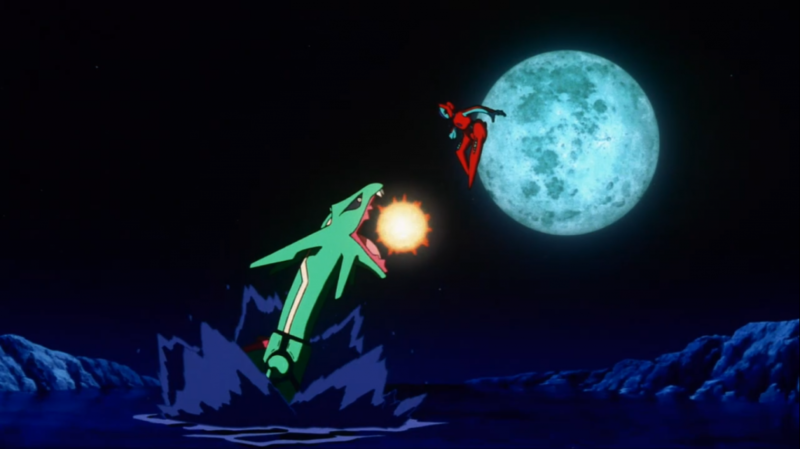 Deoxys too focuses on these interactions, but the inclusion of Tooi’s frightened yet compassionate character brings a unique twist to the formula. Considering how downright frightening some of these creatures can be, it’s a wonder that characters such as Tooi aren’t more common. What’s most striking is that Tooi’s traumatic fear of Pokemon stems from a somewhat ordinary event. It makes you wonder if Pokemon’s world should be filled with more fear: Shouldn’t more people be perturbed by these tiny creatures shooting laser beams from their mouths and leveling mountains? Deoxys gets its shine from asking these hard-hitting questions… to an extent: This is a Pokemon movie after all. You are still expected to suspend some disbelief and accept that there will be godlike organisms and technology beyond one’s comprehension, and that the power of friendship can overcomes all odds. Despite this, Deoxys shows us one of the most gritty (I use this word very loosely) takes on the world of Pokemon yet. I’ve already talked about Tooi being caught in a Pokemon stampede after the Deoxys meteorite strikes the North Pole. While it’s not unusual for Pokemon to show animal-like behavior, I noticed it more in this film than in any other. For one, unlike previous films, there isn’t a single Pokemon that speaks a word of human language. Like in the standout Celebi, we’re expected to understand the Pokemon based on their mannerisms and some human exposition. This actually benefits Deoxys greatly, especially when we consider Rayquaza. Rayquaza destroys much of the city as it hunts down Deoxys 1. Recall that Rayquaza’s whole beef with Deoxys stems from a misunderstanding that Deoxys was trespassing on its habitat. Like any powerful predator would, it attacks Deoxys to protect its turf. This primal instinct is something we haven’t seen since all the way back in Lugia, where the three Legendary Birds each were horribly prideful of their territory. In addition to Rayquaza’s brutality in hunting down Deoxys and its obvious lack of care for any damage it causes to its surroundings, we can see that Rayquaza is straight up feral.This is a stark contrast to the adorable mascot-y Pokemon such as Jirachi, Celebi, or Latias and Latios who are benevolent beings that are all about sunshine and rainbows and living in peace and harmony. No, Rayquaza is a dangerous creature that could level cities by itself if it was so inclined. The clones of Deoxys 1 are tasked with one thing: Seek out any sources of EM radiation and capture them. Don’t let him find you! It’s also interesting to note that Deoxys, much like Entei, does not have a traditional villain. In fact, though Deoxys 1 is one of the movie’s story-driving protagonists, it is very easy to confuse it as the bad guy. During Deoxys 1’s search for Deoxys 2 throughout LaRousse City, the film gives off a full-on horror/thriller vibe. The power and lights go out and people and Pokemon are kidnapped by soulless Deoxys 1 clones patrolling the city, all with eerie background music. In traditional horror movie fashion, the crew has to scavenge for food and water and flee for survival. We find out later that nobody is being harmed and that Deoxys 1 is doing all this with good, not evil, intentions. Nonetheless, it’s still creepy and misleads us into thinking that maybe the Deoxys are the evil ones. The last thing that Deoxys does exceptionally well is providing constant action on the screen. Unlike Jirachi, which had the better two-thirds of its length dedicated to exposition and relatively motionless scenes, Deoxys is packed with action, from skirmishes between Deoxys and Rayquaza to chase scenes. One thing that contributes to the movie’s kinetic feel is just how large scale a setting Deoxys takes place in. LaRousse City, while geographically smaller than the areas shown in Jirachi, feels so much larger. This is true in part because of the sheer amount of the city we see and the variety of those locations. From the streets to inside buildings, from the top of the Battle Tower to underground in the Deoxys Regeneration Lab, and through the skies as Deoxys and Rayquaza battle it out, the movie sends us all over the city. This intelligent use of space helps make Deoxys feel like a cinematic experience. I criticized Jirachi for feeling like an extended television special because the inert animation is plain and the action is sparse for most of the runtime. This is not at all a problem in Deoxys. The visuals aren’t perfect here: the quality of animation and richness of colors are similar to what we see from the TV show. However, the high-stakes story and unique sense of danger round out the immersive film experience. The plot is logical and coherent; everything ties up nicely, and the main conflict is resolved in a satisfying, conclusive manner. Deoxys makes great strides developing an identity for the “Advanced Generation” series of Pokemon films. Check back next week to see if the franchise continues its upward swing.